Remember this Further Questions post, where I asked If the Library Support Staff Certification (LSSC) program gave candidates an edge? I reached out to see if I could do a follow-up post with the people who run the LSSC program and got a very enthusiastic response, despite making contact right in the middle of Annual. So here for you my dears, is more information about this new program. I find it very interesting, because it allows candidates to pursue certification either through classes or through an e-Portfolio. It seems like an elegant compromise to the experience v. education clash that crops up so frequently in discussions of library education. Karen and Nancy have been with the program since its inception and only recently left when the second IMLS grant which funded the program ended. The program is now managed by the American Library Association-Allied Professional Association and its Director, Lorelle Swader, and Research Associate, Ian Lashbrook. Can you give us a brief introduction to the Library Support Staff Certification (LSSC) Program? 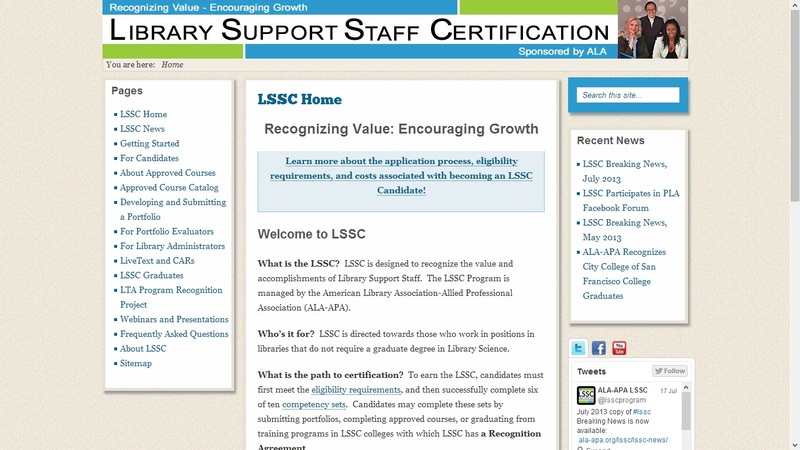 The Library Support Staff Certification (LSSC) Program has been discussed for over 30 years. The 3rd Congress on Professional Education in 2004 identified support staff certification as a priority. This led to a year-long needs assessment culminating in a grant from the Institute of Museum and Library Services to establish LSSC. The American Library Association Executive Board approved the program in July, 2009 and began accepting candidate applications in January, 2010. The American Library Association-Allied Professional Association manages the LSSC Program. LSSC is designed to recognize the achievements of support staff and provides Library Support Staff a way to achieve needed competencies. What kind of work does earning LSSC entail? LSSC adopted 10 Competency Sets and to become certified, candidates must achieve six of them. Three are required: Foundations of Library Service, Technology, and Communication and Teamwork. The seven electives are Access Services, Adult Readers’ Advisory, Cataloging and Classification, Collections, Reference and Information Services, Supervision and Management, and Youth Services. Candidates have three options for completing a Competency Set. They may complete a course approved by LSSC. A candidate may also complete a portfolio in a Competency Set. The third way to achieve certification is for the candidate to receive a degree or certification from a community college program that has a Letter of Recognition with LSSC. This occurs when LSSC reviews the community college program and determines that the program covers the three required and three elective competency sets. In order to be eligible for LSSC enrollment, candidates must have a high school degree and at least one year of library experience, paid or volunteer, over the last five years. How much time does it take and does it cost anything? Candidates have four years to complete their work towards certification. Once they begin, most candidates complete their certification work in two-three years. The cost to enroll in the LSSC Program is $350. Providers of LSSC approved courses set their fees for candidates to enroll. The cost ranges from $75 to over $1000. Candidates can choose which course to take in a time frame and location that meets their needs. Many of the courses can be completed completely online. The portfolio option, which allows candidates to demonstrate their experience and knowledge of a competency set through self-directed assignments or the presentation of professional artifacts, currently has no charge associated with it. Portfolios are submitted and then reviewed by two experts in the competency set covered in the portfolio. The submission and review process for portfolios will remain free of charge until January, 2014, at which point a portfolio review will cost $50 for ALA members, $60 for non-ALA members. Candidates have the option to take all courses, complete all portfolios, or a combination of the two. How many people have earned their certification so far? There are currently 428 candidates in the program; 60 of those have graduated and become Certified Library Support Staff. LSSC candidates are library workers who have decided that their career is working in libraries. Our profile shows that 95% are female. In terms of age, 41% are between 45-54; 21% between 35-44; 20% are between 55-64; and 17% are between 25-34. We are particularly proud that 21% of our candidates are people of color as compared with only 11% of people with an MLS. We don’t have specific data but we believe most of our candidates are employed, particularly since they must have one year of employment before enrolling. Have certificate holders expressed that it has helped them to get hired, or to earn increased pay or responsibility? Yes, some have. We are getting ready to conduct an evaluation of all candidates and that is definitely a question we will ask. Anecdotal messages indicated that they do receive both raises and more responsibility. We will have more thorough statistical data in November 2013. Have certificate holders reported any other career advantages? When I first read Nancy’s email request [for anecdotes about the value of LSSC] and had to reflect on how things may have changed for me since obtaining my certification, my only thought was that my Director took me to lunch. But since then, I have reflected more and have discovered that the process of obtaining my certification has indeed made me a better person, a better employee, and I now have a powerful entry on my resume should I decide to make a change. The economy is the problem in receiving any promotions or pay increase as all these actions are ‘frozen’ in my little corner of the world and I suspect elsewhere as well. There has been movement in my position at the library and I have benefited from being in the right place at the right time, and further with the right attitude and skills while working towards certification. But, the personal satisfaction I have as a graduate is a treasure and an investment in myself that I will always be so very proud of. I encourage all paraprofessionals to pursue this certification as I believe it serves to set us apart as knowledgeable and informed individuals serious about our profession, library support staff. And I agree the finances can pose some issues, but I also agree the benefits will be well worth it over time if you can find a way to make the investment. Is support for job hunting or career development included as a program element? Anything else you’d like to tell us about the program? Thank you for featuring the Library Support Staff Certification (LSSC) Program!